Affordable housing is a pressing problem that challenges communities today. Populations grow, but the supply of land remains fixed. Housing prices rise faster than incomes. Even middle-class folks can't afford to live in many communities any more. Cities and towns worldwide face a growing housing crisis. Living and Working in Paradise: Why Housing is Too Expensive and What Communities Can Do About It delves into the theories of economics and housing and identifies housing market externalities – growth management regulations, exclusionary zoning and land-use regulations, and second-home demand – as the causes of housing market failure and the growing community housing crisis. 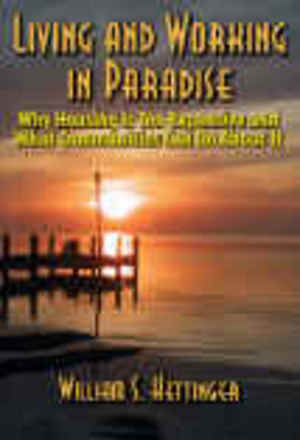 As a means of addressing a community housing crisis, Living and Working in Paradise presents the Community Evaluation and Intervention Process, a systematic methodology for examining and evaluating the housing market in a community for the existence of market failure or for the factors and conditions that have been shown to lead to market failure, and for developing a vision, strategy, and plan for community intervention to address market failure and provide housing for community residents. As proof that communities can act to address market failure, the book presents the in-depth case study of four tourism communities, each experiencing housing market failure, who have effectively evaluated their housing market and intervened to address a housing crisis. Drawn from these cases are a series of lessons for the housing practitioner, the critical success factors and other keys to the development and implementation of an effective housing intervention.